We are pleased to offer you our two bedroom spacious self-catering apartment in this Edwardian building, located close by the River Thames, with the world-famous Tower of London literally across the road, and the iconic Tower Bridge as our backdrop. Our two-bedroom apartment can comfortably sleep up to 6 people, Plus an additional travel cot - appropriate for a baby up to 18 months’ old - available on request. The apartment is elegantly furnished, providing high-quality amenities and excellent value for money, given our prestigious location next door to the Four Seasons hotel in Tower Hill. It is ideal for both business and leisure visitors alike. For business visitors, the City of London financial district is on our doorstep. For leisure visitors, Tower Hill’s environs are steeped in history, from Roman times onwards, through the invasion of William the Conquerer, to the terrible exploits of Jack the Ripper, a short distance east in Whitechapel. We then come right up to the present-day architecture of the Shard and the Gherkin, both of which are within less than a mile’s radius and easily accessible, by public transport, taxi or on foot. The area is well served by literally 100's of local restaurants to suit all budgets and sophisticated wine bars and London pubs. Sight seeing and the Theatres of the WestEnd are easily accessible by tube, bus or short cab ride. We aim to ensure that our apartments feel like your home away from home and our location next to the majestic Tower of London will leave you with fantastic memories and wanting to return! The views from each room within this elegant apartment located on the 3rd floor (with lift) of this small, quiet and exclusive residential building is spectacular. The nearby Thames path enable guests to take a relaxing walk along the embankment and take in magnificent views as they walk to nearby St Paul's Cathedral, The Tate Modern, Covent Garden and the West End beyond. Tower Hill has an abundance of high quality restaurants, which cater to every palate and every wallet. A short stroll past the 'Beef Eaters' (guards of the Tower and the Crown Jewels) you will find St Katherine's Dock filled with swanky private yachts as well a wide selection of trendy eateries. Just across Tower Bridge at Butlers Wharf you will find Sir Terrance Conran's famous group of restaurants including 'Pont De La Tour' (Fish) and the 'Chop House' (contemporary English food). Both these locations offer alfresco dining by the river for that perfect romantic and memorable evening spent watching the world go by with friends and family. Perfect for sightseeing and business trips: From our apartment you can easily visit all the famous sites without need for a car. Trafalgar Square, Big Ben and the Houses of Parliament are approximately a 7 minute journey by Tube or 20 minutes by bus. This means that guests can easily access to the main tourist attractions such as St Paul's cathedral, Buckingham Palace, Trafalgar Square, Big Ben and the Houses of Parliament, as well as the National Gallery and British museum etc. Harrods and the hustle and bustle of all shopping along Oxford, Regent and Bond Streets are also a short journey by tube or bus but Tower Hill and the City also provide an extensive choice of shopping close by. The tour buses pass outside our front door if you want the thrill of seeing the sights from the famous London Red Bus! Although we do not offer on site parking there is a public car park with 24 hour security directly across the street. Ask for further details. Although not purpose designed for the needs of people with a disability the apartment building has a lift that can fit a small wheelchair and internally each for the doorways is just wide enough. We can provide a safety platform step to assist those with mobility challenges to get in and out of the shower. Unlimited wifi is provided for our guests.. Please note that this is a complimentary service and although very reliable cannot be guaranteed and is provided as an incidental extra to our accommodation. Jane met us at the apartment on our first day to let us in, she showed us how things worked in the apartment and answered all of the questions that we had, putting our minds at ease. She went to the market for a few staple items that we might need during our stay. Jane was also available throughout our stay if we needed anything else. This apartment has an amazing view from the windows in both bedrooms as well as the living room. It is the perfect size for four and it can easily accommodate six. It is a well appointed apartment, that has most of what you will need. We did have an inconvenience, the coffee maker did not work properly(or we did not know how to work it) so we boiled water in the teapot and poured the water over the coffee in the filter and that is how we made coffee. The apartment is located in an area that is near many restaurants and transportation stations. We especially enjoyed the train, it was a nice way to see different neighborhoods in London. A car is not necessary, we walked or used public transportation. (We purchased the Oyster Card and had it sent to our homes prior to our trip) If you do need to rent a car remember that this apartment is within the Congestion Charge Area. This was my first visit to London and I did not know what to expect, but this was the perfect place to stay. I(we) want to thank both Martin and Jane for making our stay a great one, we will be back to explore their wonderful city that is rich in history. restaurants and stores so near to us. This was my second time staying at this apartment and would definitely return again. The apartment building is located next to a tube station and is directly across from the Tower of London, the Tower Bridge, and All Hallows Church. The view is amazing! The apartment is cozy and comfortable. It is also situated close to multiple pubs and restaurants and is a short walk to Tesco and Boots. Highly recommended for couples or families! Wonderful apartment for two couples. It had everything we needed and amazing location. Jayne,the manager, was very helpful. She met us at the apartment and after showing us how everything worked even went to the local grocery store with us. 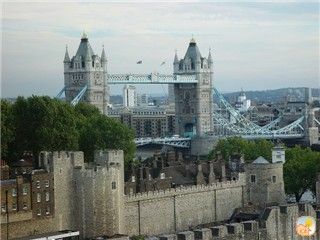 Located by the River Thames and directly opposite the Tower of London World Heritage site. From our location on leafy Trinity Square you have many transport options including Tower Hill underground station (tube) which is located on the same Square (a 2 minute walk!) Lots of buses stop close by to take you all over the capital. All major airports are within a 45 min transfer time and London City Airport is just 20 mins on the Docklands Light railway. Being located on the river guests have the option of romantic evening strolls and the Thames river boat services from Tower Pier. The immediate area is well served by hundreds of restaurants & bars and there are 3 supermarkets within a 5 minute walk for those who prefer to use our fully equipped kitchen to eat-in. Other Activities: Across the street from the world famous Tower of London & all major London attractions easily accessible by public transport, walking, river boat, or bus.